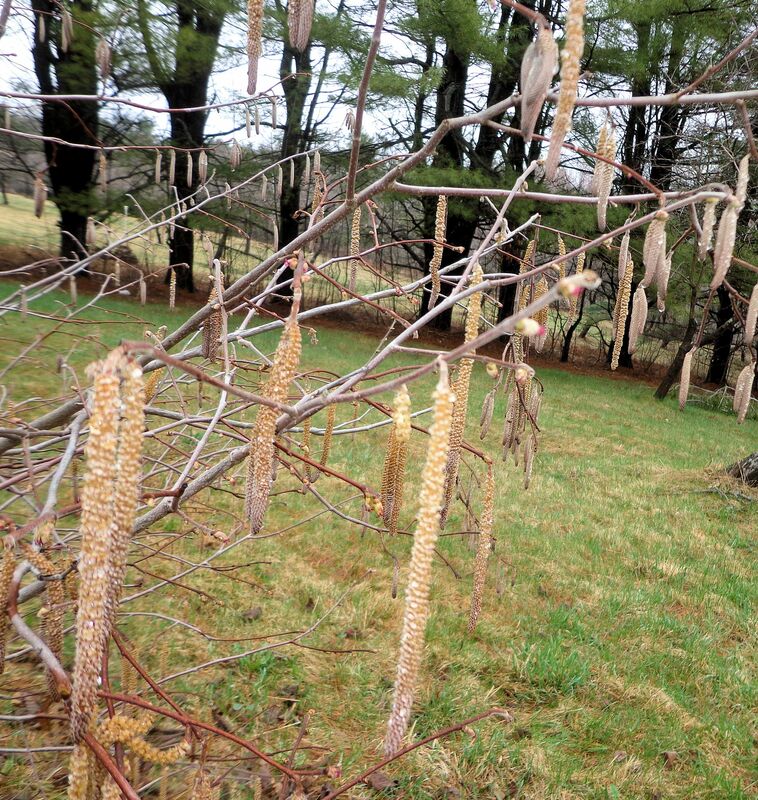 The three young hazelnut trees I’ve planted in the orchard all survived the winter and are in bloom. Each plant has male and female flowers. The males are long catkins filled with pollen. The females are tiny, round, bud-like forms with projecting bright red styles. 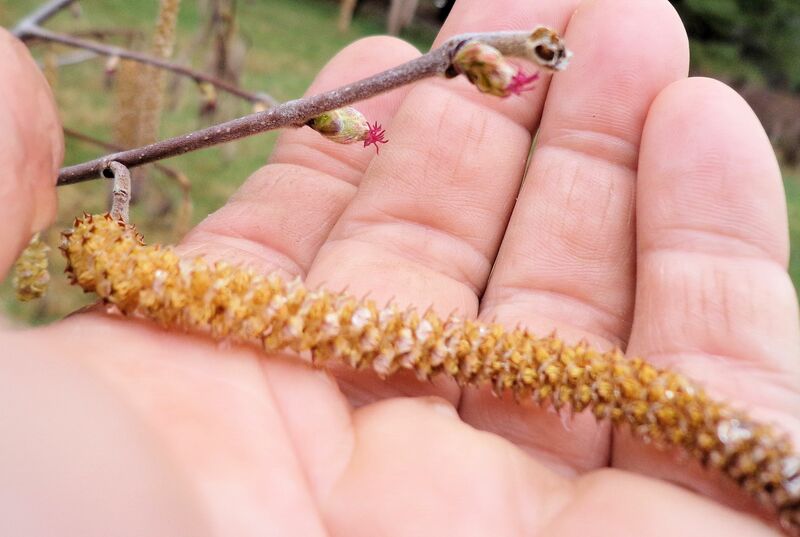 Hazelnuts are wind pollinators, which explains why such copious amounts of pollen are produced. The plants must cross-pollinate to produce nuts, they are not self-pollinating. The woods are full of wild hazelnuts in bloom; some of their pollen could also easily reach my little trees. 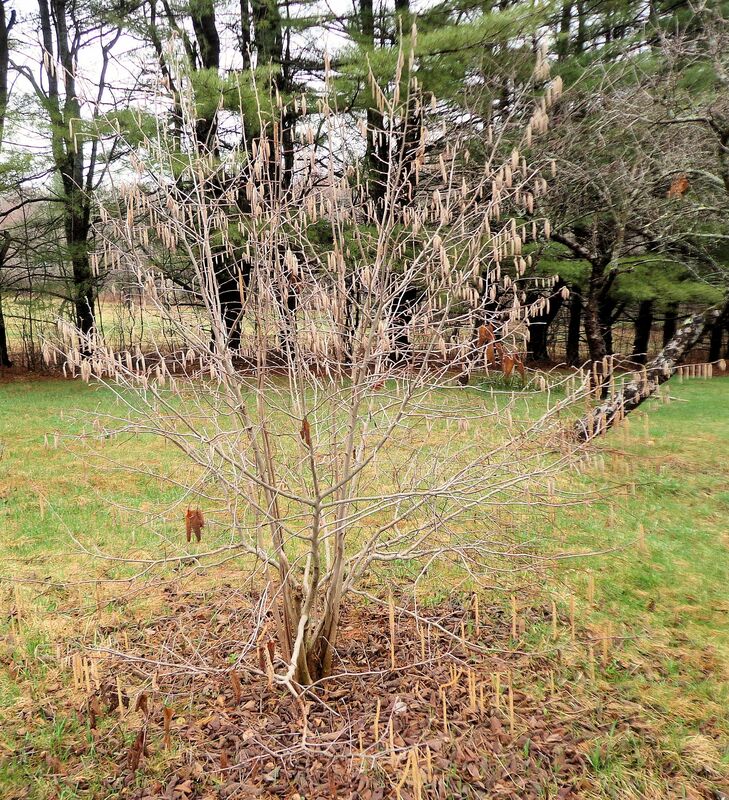 The largest hazelnut bush grows in leaps and bounds every year. This spring I trimmed out some of the oldest, least productive limbs. I gave the trimming to my rabbits. Bunnies love hazelnut wood! This largest plant has produced a crop of nuts for the past 3 years or so. This year it is covered in blooms, so if all goes well I will have hazelnuts to eat in September. The other two trees are smaller. One, the same age as the the largest bush, is only starting to thrive after its transplant a few years ago. The other hazelnut survived the second winter. 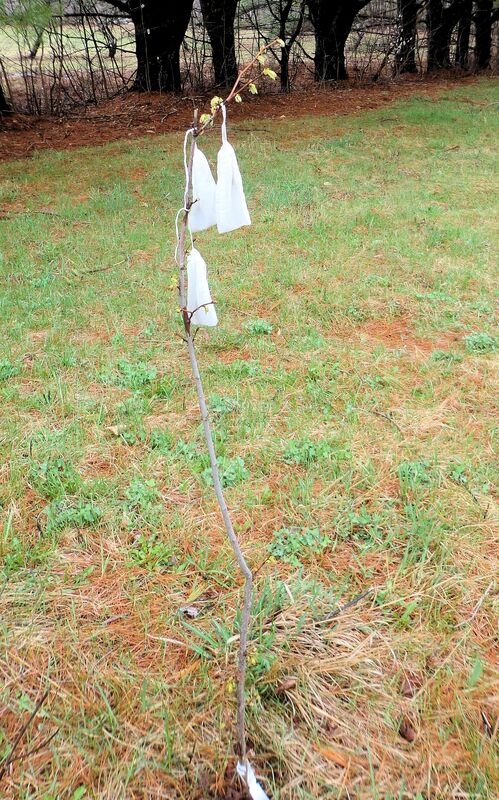 The white bags on this tree are an experiment I conducted over the winter. Last year, the poor sapling was nibbled by deer. The original leader was nipped off and a side branch has become the new leader. 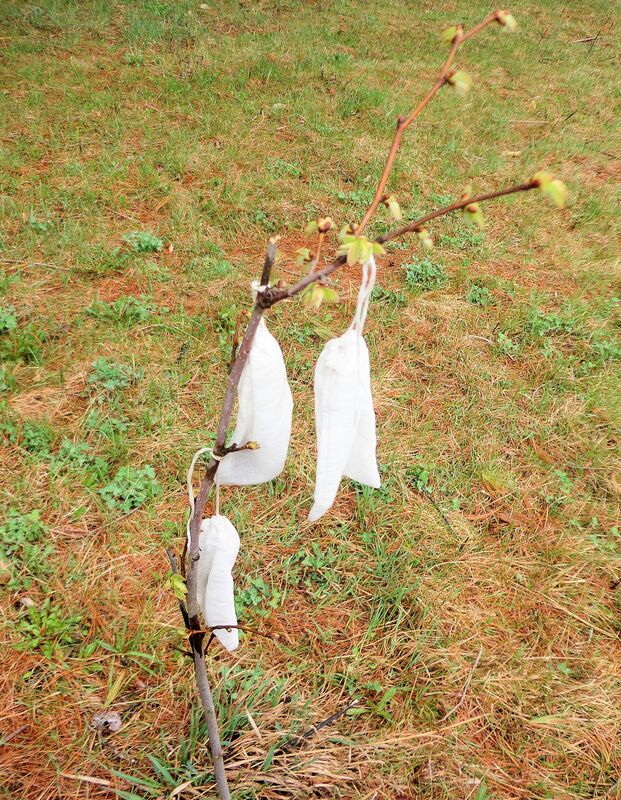 I had heard of placing human hair in cloth bags and tying them to the branches to deter deer. 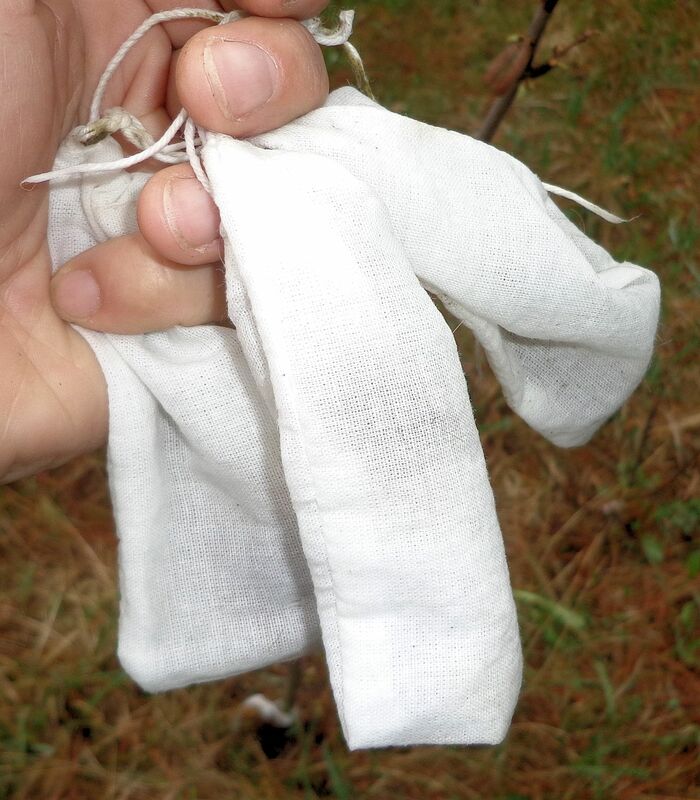 When my husband got a haircut last fall, I collected the hair and tucked it in some small muslin bags I had on hand. 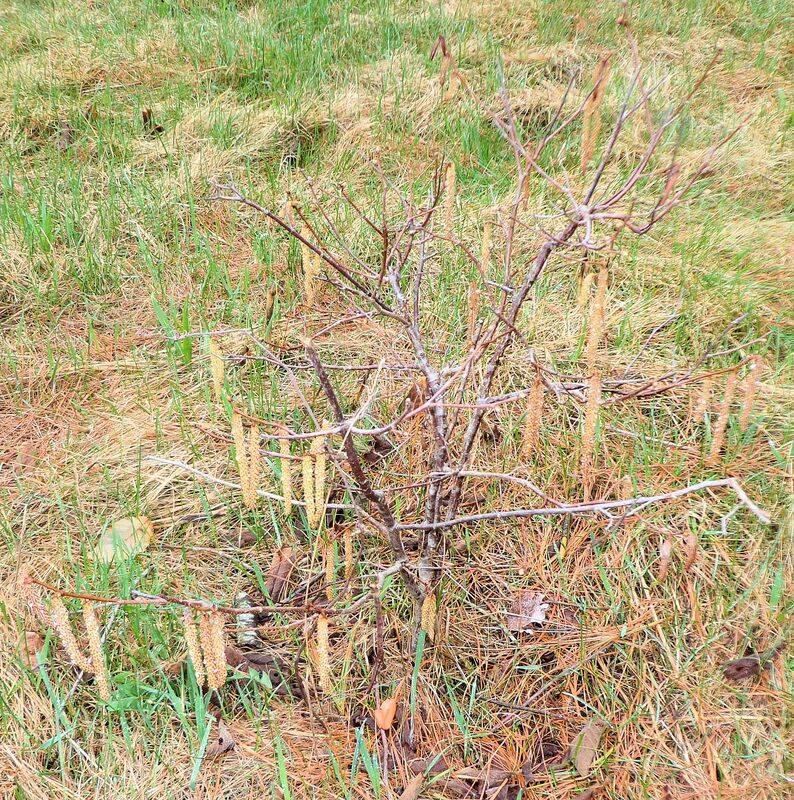 To my surprise, the tree was not touched by the deer last winter, although they had plenty of opportunity. So perhaps this strategy actually works! I’m glad, since this was an expensive little hazelnut, purchased from Stark Bros. nursery. The other two were quite inexpensive and came from The Arbor Day Foundation. I bought the Stark tree because it is supposed to produce large nuts. Hazelnuts are my favorite for eating, so I’m rooting for these trees to do well. Chicken society can be brutal. Ameraucana chickens are known to be less aggressive and more tolerant of other birds than many breeds. That does not preclude them from becoming vicious at times. 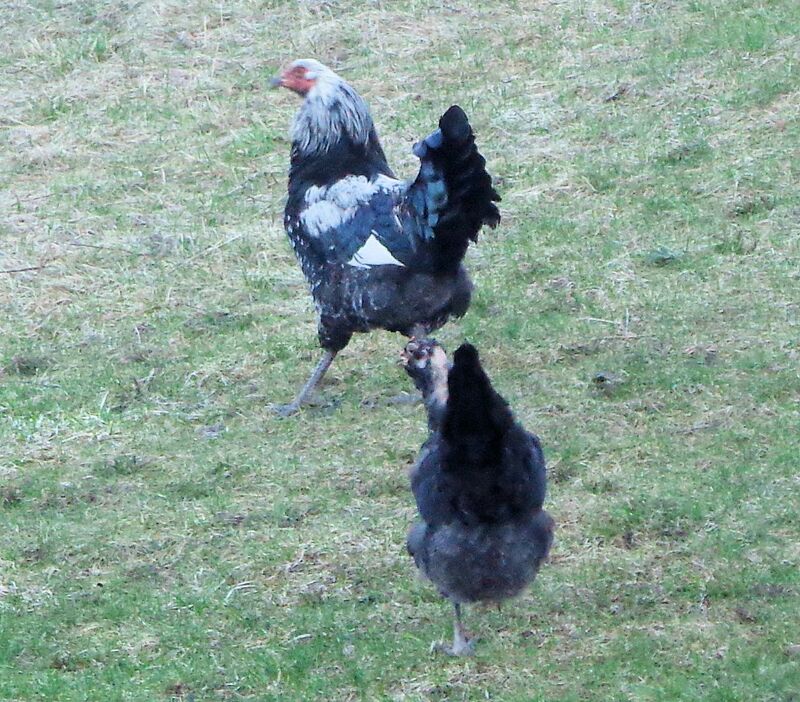 This hen is part of the flock, hatched at the same time as the rest, raised as a sister. Yet, one morning in the middle of the winter when I did chores, I found this hen with her head all bloody. 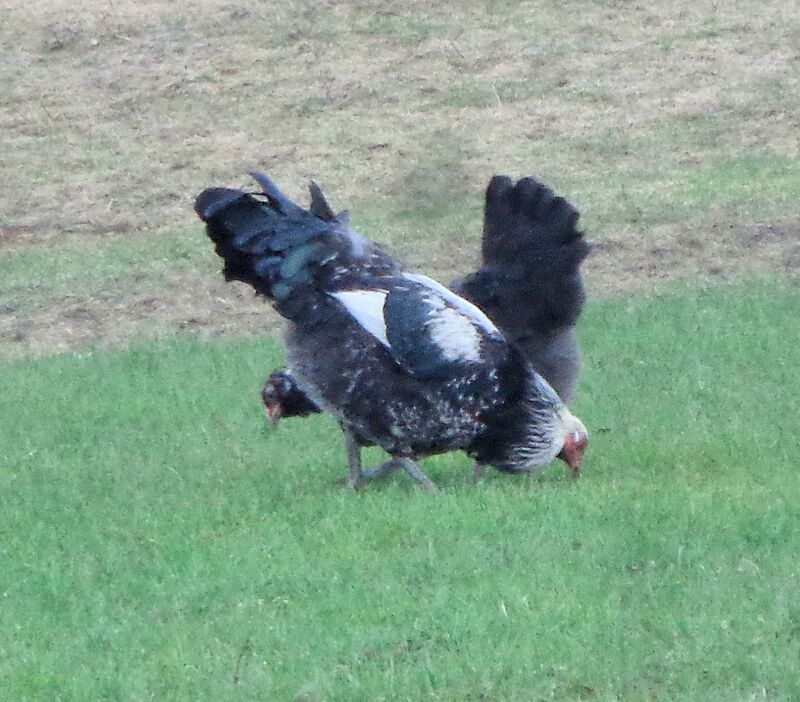 I thought the weasel who attacked my flock in December had a relative trying to prey on my birds. I locked them up tight at night for awhile. The hen began to heal. Then one morning, again, her head was all bloody. She was also acting afraid of the primary rooster and trying to stay away from him. I closed her away in her own smaller pen and her head healed. Just about the time she was starting to look good again, she escaped from her pen and went in with the others. Everything seemed fine that day. She went to roost with the rest of the flock. The next morning, there she was again, her head pecked into a bloody mess. This time I ensured her enclosure was completely escape proof. I gave her a nest to use and after a few days she began laying. She was separated from the other birds by wire so they could still see each other and interact. When her head was well healed I tried once again to introduce her to the flock. 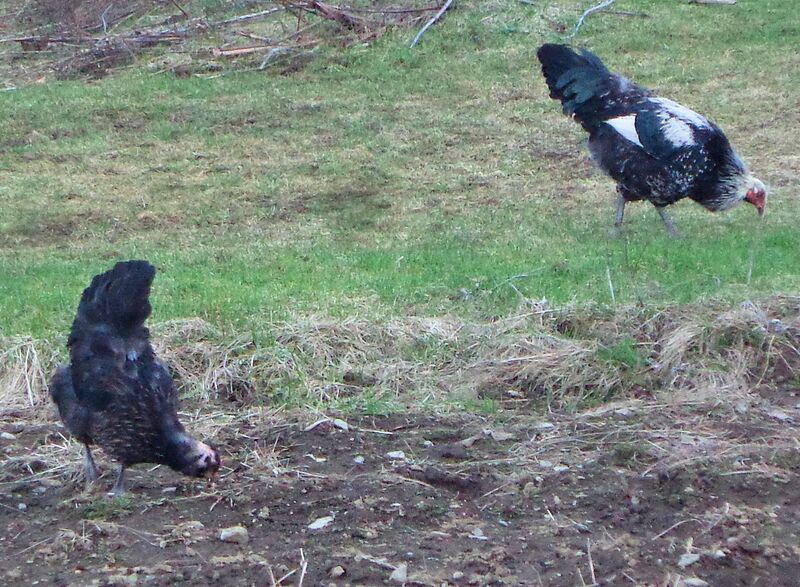 Within minutes, as I watched, the rooster went after her, attacking her head. Quickly, I scooped her up. I don’t know why the rooster took such a strong dislike to this hen. She looks like everyone else. She lays an egg a day. She is docile and submits to the rooster. Perhaps she said something to insult his male pride and he won’t forgive. Who knows? Chickens are ruthless. So, to keep her company and fertilize her eggs, I placed the auxiliary rooster in her pen. He is the back-up in case the main rooster dies. The birds hit it off immediately. He is a perfect mate, considerate and gentle, always finding little tidbits to entice her affection. She cuddles up close to him at night on the roost. They are so happy together. Every day the main flock goes out to free-range in the afternoon and returns to the roost about an hour before sunset. When the coast is clear, I lock the main flock up and let the hen and auxiliary rooster out to roam. Their happiness is complete. I’m hoping the poor hen will grow feathers on her head again. With all the trauma the skin has endured, she may remain a bald bird. We found a puppy! Picked him up yesterday, an early birthday present for me! 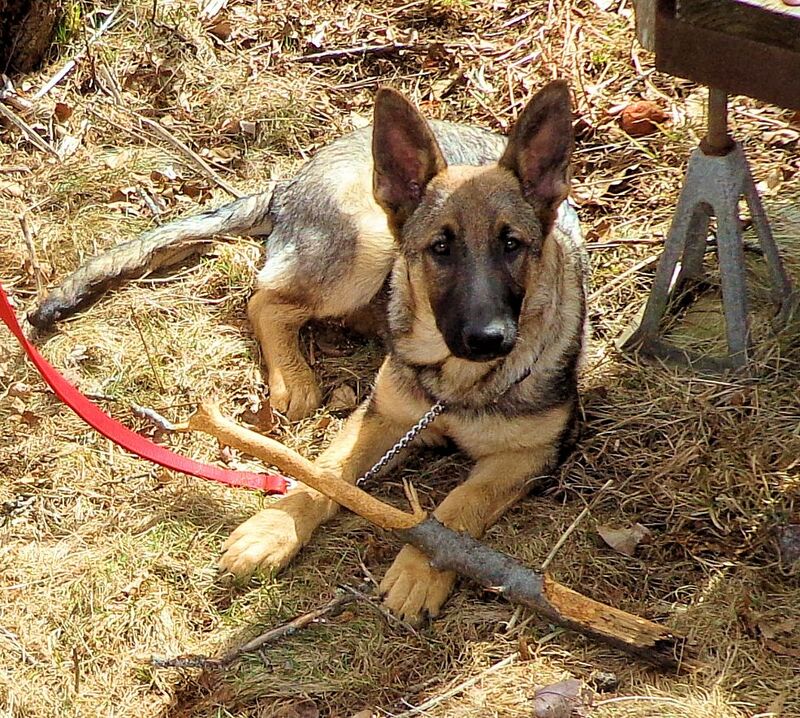 Max is a 4.5 month old male German Shepherd from very good bloodlines. His grandfather was imported from Germany. His parents had their hips and elbows certified and were genetically tested for the major inherited breed conditions. Such a sweet, calm and smart boy. He already loves his new people, and new best buddy Otto. Max was not house or leash trained, but is picking both up very quickly. He knows his name after one day! He loves his new farm home and acts like he was born here. The cats aren’t quite sure what to make of him, but I think they will come around. They lost a lot of trust in strange dogs after the recent episode with Becky. When the pup barks at them, the cats scatter. They come back sooner each time and Max is trying very hard to learn not to bark or whine at cats. Yesterday was the first time he ever saw a cat. Although he was never crate trained, he did perfectly last night in his crate. No whining, and he slept all night with no accidents. He was ready to go out in the morning! Luckily, Tim wakes up early and took him to do his duty before 5 am. Nine-thirty pm to five am is a long time for such a young pup to hold it, but he had no accidents. So Max is learning and experiencing all sorts of new things. He is a bit afraid of chickens, the flapping and squawking disorients him. The horses must look like giants. He maintains a respectful distance. Max should grow into his ears one day, his dad weighs over 100 lbs. He will be black and tan with lots of silver, a very nice color. Right now the pup is in the middle of teething. His gums are sore and his eyes run occasionally from the trauma of erupting teeth. 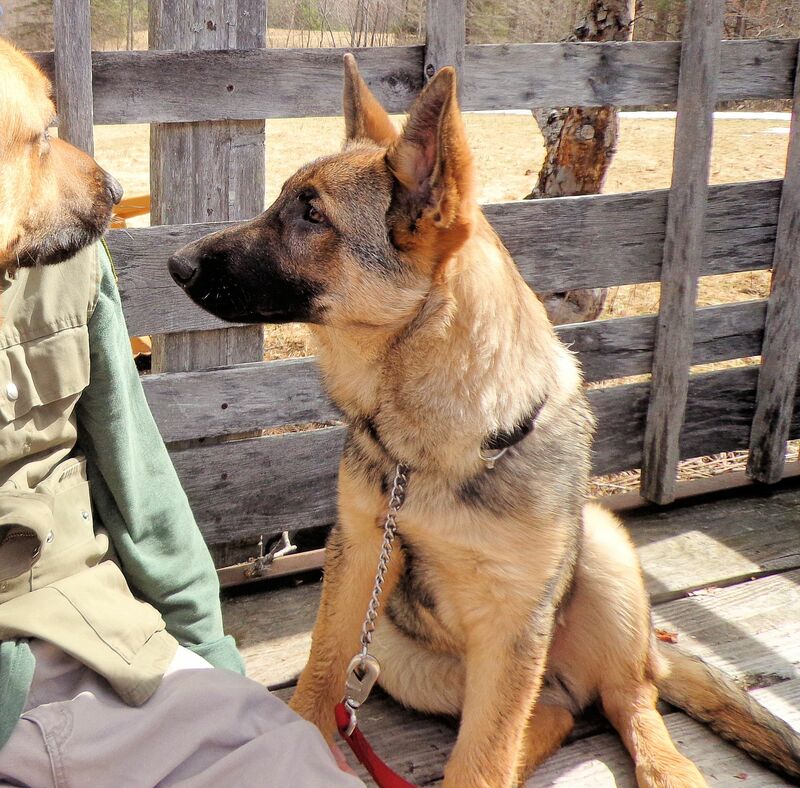 Although I did not want to get another German Shepherd after we lost Holly, I realized after looking at many breeds of dogs that this breed is my favorite. The massive amount of shedding is a pain to deal with. I’m devising strategies to better handle the hair including more frequent brushing and also periodic application of the high power air dog blower. It is really fun to have a puppy again. Almost like having another kid! The new incubator is up and running with the first set of eggs. It’s a Brinsea Ovation Eco 28, a new design for Brinsea. 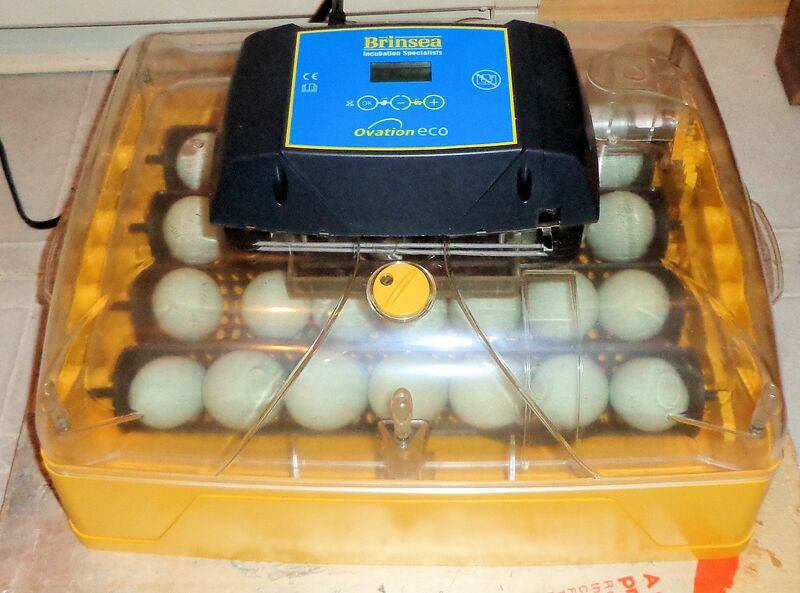 The incubator has automated egg turning and digital temperature control. The humidity control is done manually although you can purchase a separate attachment to automate humidity. So far the incubator has been running great. It maintains a temperature of 99.6F, with no fluctuation I have noticed. There is a warning alarm if the temperature goes above or below a pre-set level. This incubator is a big step up for me, function-wise and price-wise. For many years I’ve used styrofoam body incubators. 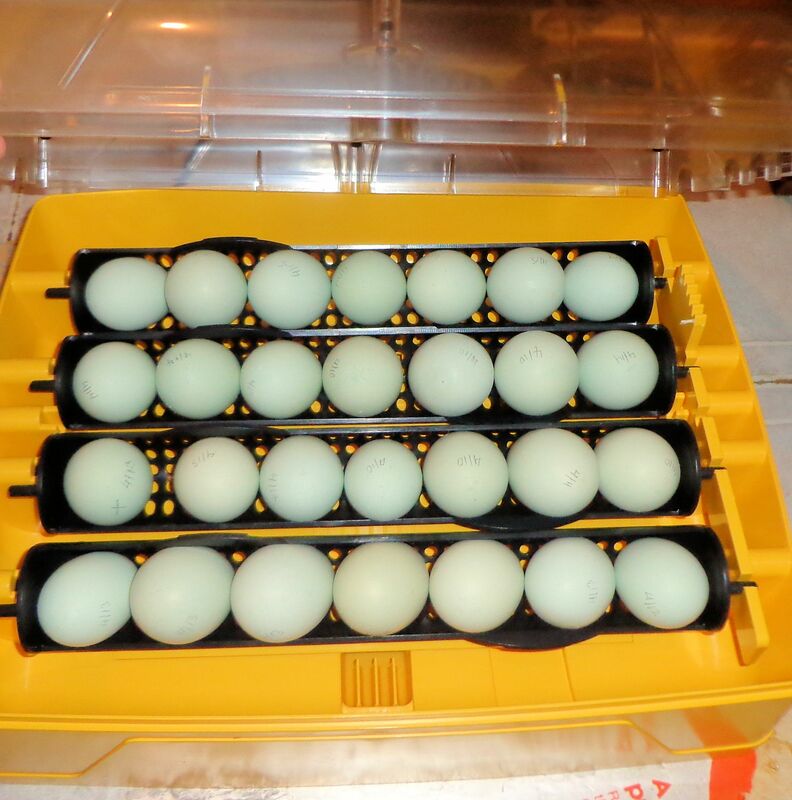 The first one did not have automatic turning so I had to turn the eggs by hand twice a day for 19 days. Then I got one with egg turning racks and a blower fan. It was around $175, a Hovabator. The hatch rate for the styrofoam incubators was always disappointing for me. It rarely got over 70%. Some hatches were dismal with only 40% or so. The poor performance was most likely due to difficulty with maintaining correct warmth and humidity. A chicken breeder said try a better quality incubator, so this year I finally sprung for the $380 Brinsea. It has a hard plastic case. The digital temperature control is much easier to use than the old manual control on the Hovabator. The Brinsea only holds 28 hen eggs as opposed to 42 for the Hovabator. In the past I was lucky to get 18-20 chicks in a hatch. Most of the time there were less. But with Brinsea users attesting to 90% plus hatch rates, I may end up with more chicks than ever before! I’ll just have to wait another 20 days to find out! 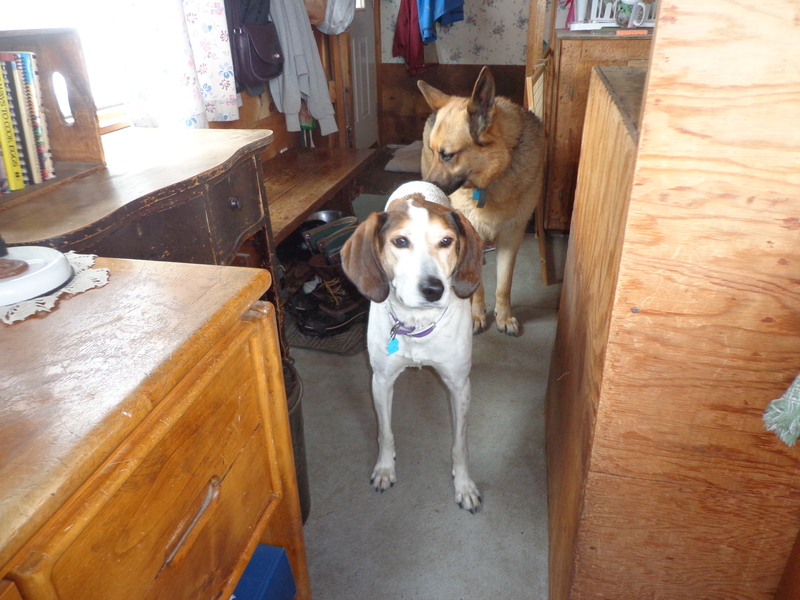 Here is Becky, a nine-year-old foxhound-type who came to our farm as a foster-to-adopt candidate. Amazingly, for an old dog, she has tons of energy, a great body condition and seemed to be fitting in. 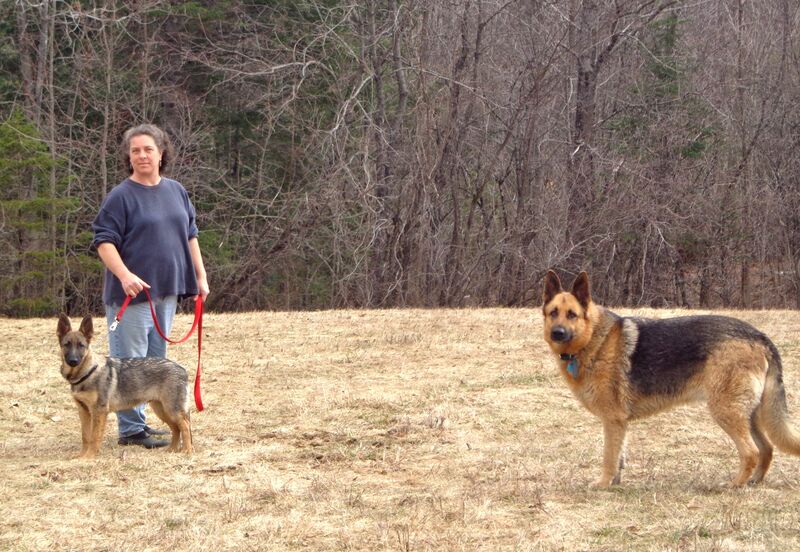 After the loss of Holly, our older German Shepherd, we felt ready for a new companion and a friend for Otto. Maybe an older, harder to home, shelter dog could find a place with us. We decided to try. Our style of keeping dogs involves off leash and under voice command outside, movement restricted to the dog area inside. Becky quickly adapted from having the run of a house to staying in the dog area inside. For an old dog with minimal leash training, she was making strides in responding to voice commands on the leash in preparation for off-lead. She and Otto quickly became pals. The first day she was here, she charged at a cat who came to investigate the new arrival. At our house, the cats and dogs must get along. Our tiger cat Toby, who is sixteen, Chloe the tuxedo kitty and the two brother cats, Kai and Cary who came to us as newborns from the shelter, all enjoy being with dogs. After a few days, the cats had forgiven Becky’s early poor manners and returned to try and make friends. Things seemed ok. Becky would lie down and tolerate a cat within a foot of her with no aggression. Everyone thought things would be wonderful. Then, two nights ago, as I worked on the computer and the dogs rested in their area, all the cats came to visit me. As is their furry wont, kitties sat beside me on the desk, curled behind me to look over my shoulder and settled nearby to observe. All was quiet and content. Toby had climbed on a bench and curled up for a nap. After about ten minutes, for no reason I could discern, Becky suddenly jumped up and rushed at Toby, sending him, and the other cats, scattering for the hills. Maybe it was a game for her; jump the cats and see them run, perhaps she just got sick of a feline relaxing bold as brass six feet away from her, who knows why she did it? She ruined her chances of living at the farm. We cannot trust her with the cats so she must go. Since then the cats have stayed clear of Becky. I’m hoping that continues until Tuesday when I return her to the shelter’s foster home an hour away. Too bad, she is a nice dog otherwise. I’m thinking now that the easiest way for us to get the sort of dog that can coexist with our menagerie of cats, horses, rabbits and free-range chickens is to start with a puppy and train it ourselves. The strategy has always worked in the past, guess we should stick with it.